Update: I’d love to hear from you — what would _you_ use this map for? What have you learnt from it? What do you want to learn? New Zealand in particular — but I wouldn’t be surprised if many countries more generally — has an issue. We know that there are lots of people working in what I call the “openX” space: open data/gov/source/access and civic tech. We know there are organisations, communities and initiatives / programmes in this space, too. But no one has a cohesive overview of it. It’s stuck in our heads, and the heads of our contacts. The human and organisational superconnector nodes in our networks, and maybe awards and funding documents. Bit and pieces scattered all over the place. Let’s change that. Together. I’ve been thinking about it for the last coupla years, and yep, it’s a network graph Plus*. Welcome to the openX ecosystem map: a living, crowdsourced view which will grow as we all add to it. Embedded version of the ecosystem network graph. Go to https://kumu.io/aimeew/the-openx-ecosystem#openx-ecosystem for more details, or read below. It’s a pilot. A prototype. A proof of concept for how we could start building a much more comprehensive view of who’s out there doing what. So we can all connect better. So new people can find people and places to start. So we can try avoid wheel reinvention. It won’t be perfect, but it’s a place to start. 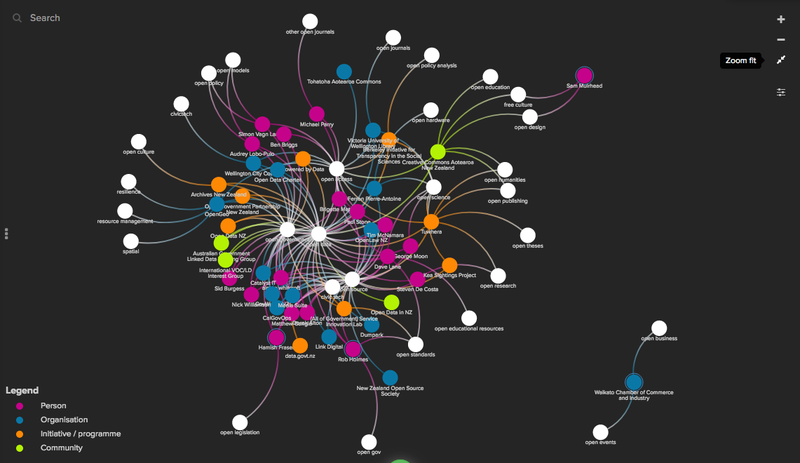 It takes in information about people, organisations, communities and initiatives / programmes working in the openX space**, and turns it into a CC BY 4.0-licensed spreadsheet and network graph you’re able to analyse in any way you like. You can add to it with a simple form. I built a (much more) basic proof of concept back in 2016 but the amount of manual coding required back then made it a terrifying prospect. There are much, much better tools now, so I’m picking it back up. I’d like to say thanks to the fantastic GSUCNZ attendees and organisers, who recently helped me test out a simpler version of this. It’s all still a work in progress, but I believe we can get there! * The Plus is because this will have some very simple GIS elements initially (asking for a rough location, basically), which will allow us to map this info differently. And, down the line, I wanna find a way to make this 4D, and involve time and how things shift and change. It’s how I see it in my head, and I have some thoughts, but always happy to hear yours! ** Disclaimer — I’ll have to do a bit of work behind the scenes to keep things tidy, so if the spreadsheet looks slightly different at some point to what you put in, please don’t get a fright. If you want me to change things back, or change them at all, just get in touch at aimee (at) govworks.nz or on Twitter at @teh_aimee.